Early riser, short napper, constant night waking- sound familiar? You've already spent countless hours researching online- yet your baby is different and nothing is working- and you're ready for change! We offer customized solutions for every family- together we can help your child learn to love sleep! 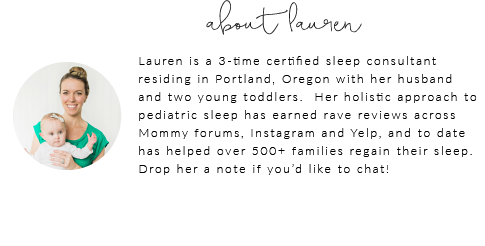 Work directly with founder/sleep expert Lauren Olson, we don’t “sub out” any of our clients to interns or assistants! For babies 0-3 months old. For babies 4-24 months old. For children of all ages, siblings & multiples. + Give suggestions for creating a sleep inducing nursery or bedroom that everyone is comfortable with! Don't quite need a full consultation but still need some guidance? Check out our Sleep Survival Guides! + Review your child history form in detail and get to know one another! For clients interested in 2-5 smaller areas of assistance regarding sleep (daycare sleep, sleep regression help, nightmares, new sibling, etc.) with a child that sleeps fairly well already at night/naps who has developed a minor sleep issue. You will receive a verbal sleep action plan, however no support is included. This package is available as a 30-minute phone call with one follow up email. For children 0-5 Years Old. In-Home Package: $300 combined with any package above. Subject to availability, within the Portland, OR area. If needed in addendum to any packages above.